There is something very satisfying about growing your own carrots. For a start it is very easy to have a supply of carrots for at least nine months of the year and even longer with a bit of luck and good management. You will be pleasantly surprised by the flavour of home grown carrots. They might not be as unblemished or straight as those supermarket types but they have a flavour that many modern mass market carrots seem to have lost. It should be no surprise that carrots are the second most popular vegetable in England after potatoes. The average person eats 13lbs a year. If more people realised the true nutritional value they would eat double this amount. Find out about the nutritional values by clicking here. Carrots can be problematic for some people. Sometimes things work well in one place and not in another. If you’ve had difficulties growing carrots, keep trying new varieties and different methods, keep amending your soil, eventually you’ll find a variety and care plan that works for you. The aim is to grow straight, smooth roots. The best soil for carrots is deep sandy loam or loamy soils with a loose structure. Sand is easier to clean off at harvest. Heavy, stony, compacted or poorly-drained soils cause deformed roots. Avoid very light soils which can be blown away, as young plants are easily damaged by wind-blown sand. Carrots like loose rich soil, preferably a little sandy, and soil that’s been worked quite deeply. Having loose sandy soil, will allow you to grow long slender straight carrots. If you have heavy soil try growing shorter round "golfball" varieties like Paris Market or Oxheart while you spend time amending and loosening the soil. Remove as all rocks and debris, because carrots will form “legs” or mis-form when they hit a rock. Some people find that using a seed tape increases success rate, although they are not readily available for domestic growers. This website shows you an easy method for creating your own. Here. There are however many more varieties and variations within these types and the breeders are constantly striving to create new varieties to match what the farmers, supermarkets and consumers desire. These desires include high yield, better taste, colour, better for baby cut market, better for processing market, shelf life, disease resistance, carrot fly resistance, best for bunching, and best grown in the various environmental locations (eg dry climate, sandy soil etc). Imperator -- Most common type grown for the commercial fresh and "cut and peel" market. Long (8 - 10"), tapered, slender roots, small core, deep orange color, smooth skinned. Danvers -- Wider at the top than the Imperator types and have strong flavour. Used for both commercial fresh market and processing. Sometimes referred to the "half long" carrot. Root length is medium (6 - 7") with a conical shape but thicker in diameter (2- 2 1/2") than imperator types. Pointed or somewhat blunt root tip. Excellent early quality but can become woody with age. Nantes -- Grown for both the commercial fresh market and processing. Roots are medium in length (6 - 7"), 1-2" in diameter, cylindrical, generally with a slight shoulder and an abrupt, blunt taper. Known for excellent colour and quality.Up to 7 inches long, more cylindrical than tapered, sweet flavour. Chantenay -- Up to 5 inches, wide at the top and tapering. Primarily used for processing due to its excellent yield recovery. Not generally used for fresh market because of coarse raw product root texture. Roots are short to medium size (4 1/2 - 5 1/2"), with a large diameter at the crown (2 - 2 1/2") and a conical shape that tapers quickly . Colour is generally lighter than other types. Generally, late in maturity. The true "baby carrot." Mostly used for the cello bag. Also used in processed mixed vegetable packs. Roots are short in size (2 1/2 - 4" long and 1/2 - 3/4" diameter at crown) with a slender, cylindrical shape. Can be difficult and expensive to grow. Generally, these carrots should be harvested at an early stage of development or they become quite woody. Comment: Most "baby carrots" are manufactured through extensive cutting and peeling of undersized or damaged carrots intended for other fresh markets or produced by controlling their size by using high plant populations. Paris Market -- Round, short, about 1 ½ inches in diameter. Golf ball-type carrots (Thumbelina) are good for containers and heavy soils. Short carrots also mature faster, shaving two weeks off the time it takes to put them on the table. No one really knows how many varieties of carrot there are as new ones enter the market every year, and others disappear (fall out of popularity). Cornell University (New York) list 144 varieties here. Carrots fall naturally into groups according to their use, to see photos of some of these varieties click here. For the A to Z of common varieties click here. Fast maturing varieties: bred for forcing in cold frames or under cloches. The Amsterdam and Nantes types are shorter than main crop carrot and cylindrical rather than tapered, try Bolero and Ingot. Stump Root Varieties: such as Early French Frame, these together with the fast maturing varieties often possess good flavour and can be frozen whole. For tiny gardens and window boxes: try a round sort such as Rondo or Suko. Carrots do well in containers. Choose pots that are at least 12 inches deep and have good drainage. Use potting soil enriched with compost and keep the soil moist. For best results, look for small or "baby" varieties such as Thumbelina, Orbit, Parmex, Oxheart or Little Finger. Traditional Summer Carrots: these have the prefix Chantenay which are short and squat with a pronounced taper. For eating over Winter: one of the best in Autumn King, with a good flavour and long tapered roots, Long Red Surrey, first introduced in 1834, has to be one of tastiest varieties as it has a distinctive yellow core, it is out of favour with commercial growers but well worth growing. James Scarlet Intermediate is another older main crop (1870) and well worth the try. The healthiest Carrot? It's got to be Juwarot containing almost twice the carotene of any other carrot. High carotene carrots you can grow are 'Ingot' (particularly sweet flavour), 'Beta Champ' (great for juicing) and 'Healthmaster' (slow to grow but again quite sweet). Some high carotene carrots also tend to be high in turpenoids which can make some carrots strong tasting and bitter. If you are allergic to carotene sow White Fodder and you will not be disappointed. Golf ball-type carrots (Thumbelina) and the slightly longer Chantenays are good for containers and heavy soils. Short carrots also mature faster, shaving two weeks off the time it takes to put them on the table. Nantes, Imperator and Danvers (and Danvers Half Long) grow up to 7 inches long and are suitable for most other soils. If colour is an issue, Danvers Half Long and Royal Chantenay are bright orange, while Scarlet Nantes and Blaze (an Imperator) are deep orange, almost red. Note: It is always recommended that you read, understand and follow the instructions on the seed packet; they are normally written by people who have planted these types of seeds before, with success. A good mulch of leaf mould applied in autumn is ideal preparation for growing carrots, helping to create the fine seed bed they need. They do not require much feeding. Land that has been composted or manured for a previous crop is preferred. These should be sown as thinly as possible 12-20mm deep in rows 150mm apart Space early varieties 100mm apart so they can grow quickly; 50mm apart for main crops. If your soil does not easily turn into a fine seed bed you may find that covering the seed with a mix of sand and leaf mould does wonders for emergence. This takes about 10 to 12 days depending on soil temperature. You can speed things up by buying primed seed in which the germination process has been initiated by the seedsman. Soon after they have emerged cover ,with a fine mesh netting and leave in place for the entire crop. This will let in light, air and water but keep pests at bay. Keep the seedlings warm and moist. Keep weeds control. Thin to 5 cm apart. Keep watering - but too much. Harvest when the top of the carrot is 2-5cm in diameter. There is no need to harvest all at the same time. Remove tops before storing. Wash and keep carrots in the fridge in airtight bags to retain moisture. Plant in spring, 2 to 3 weeks before last frost, ½ inch deep, ½ inch apart, in rows 12 to 24 inches apart. Do not work compost, fertiliser or manure into the soil just before planting. Rich soil will result in excessive leaf growth and forked, hairy, rough roots. Water the beds well, immediately after sowing. To speed germination, water lightly daily if the soil is dry. Deeply worked soil with fine, weed-free seedbed will greatly improve chances of successful crop. Carrots are slow to germinate (1 to 3 weeks), and often germinate unevenly over a period of several weeks. Thinning is critical to reduce competition from neighbouring plants. Thin to 1- to 4-inch spacings (depending on size of root desired) before plants are 2 inches tall. Cutting rather than pulling reduces disturbance of the remaining plants. To improve germination in dry weather: Make a small furrow, about 2 inches deep. Plant seed and cover with about ½ inch of soil. Cover furrow with a board to retain soil moisture until seeds germinate. Carrots prefer light sandy soils so if your garden earth is on the light side you will have no problem. If you garden on clay o r stony land then your carrots will always struggle. You will not fail so long as you are careful which varieties you choose - round or stumpy rooted types will succeed practically anywhere, whereas long rooted, tapering types will faulter. Carrots do well in containers. Choose pots which are at least 12 inches deep and give them good drainage. Use potting compost and keep them moist at all times. For best results try small varieties such as Parmex, Oxheart of Little Finger. If soil or space is a big issue for you please note that Carrots and other root vegetables will grow well in containers as long as the pot is deep enough. Be sure to choose a container that is twice as deep as the length of the carrot at maturity. The first few weeks after sowing determine the size of your crop. Carrots do not tolerate a deep planting in a dry bed, so the trick is to offer them a shallow sowing with even moisture. The seedlings grow slowly and can't compete with weeds. As they develop top dress with old manure or compost, avoid "hot" nitrogen sources like fresh manure and fish fertilizer as they cause new roots to "burn off" and fork. Hand weeding is recommended until the carrots are 5cm tall. Thin the carrots to 8cm apart, then mulch with clean straw and compost to keep the weeds at bay. Mulching also helps the soil retain moisture and prevents "green shoulder," which is caused by exposing the crowns of the carrots to the sun, making the roots bitter. If the tops of your carrot roots start to turn green, pull the soil up around them. Over watering your carrots can cause the roots to crack. Harvesting - Most carrots can be harvested in less than three months. they can be picked anytime they reach a usable size. The largest carrots will have the darkest, greenest tops, but don't leave the roots in the ground too long or they will be tough. Most are at their prime when about 2.5cm in diameter at the crown. Do not be fooled by the tops which can be quite bushy but in fact the carrots themselves are quite small. When harvesting, drench the bed with water first, making the carrots easier to pull. When you find a carrot large enough, grasp the greens at the crown and tug gently with a twisting motion. If the greens snap off, carefully lift the carefully roots with a small fork. Use damaged roots right away and store unblemished ones. Lifted carrots should not be left on the ground surface for too long as they will attract the attention of carrot fly. Cut the leaves off as soon as they are out of the ground; as long as they are attached they continue to keep growing and draw moisture and nourishment from the roots. During the first five months of storage, carrots will actually increase their vitamin A content; and, if protected from heat or light, can hold their nutrient content for another two or three months. Since carrots are rich in beta carotene, steaming them makes this nutrient more readily availability to the body as heat breaks down the tough cellular walls that encase the nutrient. The crisp texture of carrots is the result of the cell walls being stiffened with the indigestible food fibres cellulose, hemicellulose, and lignin. Dealing with carrot fly. HERE How do Carrots produce seeds? HERE Download your own Growing Card here. Why do carrots flower rather than form a usable root? Carrots require cold weather (chilling) to form flowers. If planted too early, this can occur. Why do some of my carrots form many roots rather than one long root? Carrots form multiple roots (fork) when damage to the primary root occurs. Forking is associated with rocky, stony, or heavy soils. Carrot fly damage can also cause this problem. Deep digging, the addition of compost, and pest control will help reduce this disorder. I regularly have very pale yellow coloured roots. Why does this happen? Hot weather and hot soil temperatures are responsible for poor colour formation in the roots. When temperatures go above 85°F, keep the plants well watered and mulch around the roots to cool the soil. More answers here. The carrot is a cool climate crop and can be sown early in the Spring in temperate climates, or in the autumn or winter in sub-tropical areas. The carrot plant is biennial, that is one which completes its life cycle in two years. It stores in the first year what it is going to use in its second to produce seed. We interrupt its life cycle by gobbling it up in the first year before it has time to reach maturity. In the firs t year the plant produces the fleshy orange tap root which is eaten. If left in the ground the plant will flower the following spring. Read more about how carrots flower and produce seed here. Read more about hybrid seeds here. The carrot's fruit is an akene, (a dry indehiscent, one-seeded fruit, formed from a single carpel and with the seed distinct from the fruit wall.) and holds thorns that allows it to remain on the plant during ripening. So called seeds derived from plants in the carrot family are not actually seeds at all, but rather complete fruits that are dried. These include anise, caraway, coriander, dill and fennel. There are three enemies of carrot storage: wilt, re-growth and rot. The first of these is no problem if the carrot is stored where the humidity is high. The second is of little consequence if the carrot is stored at 0 to 5°C. Companion Planting - Carrots do well alongside most plants, especially chives, Rosemary and Sage (which deter Carrot Fly). Dill, Coriander and other members of the Umbelliferae family should not be planted near carrots as they tend to cross pollinate which can be important if you are subsequently trying to save your own seed. To see an explanation of the various parts of the carrot root, including diagram click here. Examples of typical carrot root shapes here. How do carrots produce seeds ? Carrots are biennial plants and only flower every two years. In the first year the plant produces the edible root and a leafy top. If a carrot plant is left in the ground for another year, it flowers and seeds are produced. If the original carrot was sown using F1 hybrid seeds it may not reproduce properly, or not at all. Sexual reproduction in carrots is therefore not different from other flowering plants. Pollen is produced and transferred to the female part of the flower, the stigma. The pollen grain then delivers the sperm cells within it to the ovary via a long tube where fertilisation takes place. The seeds are tiny - a teaspoon can hold almost 2000! 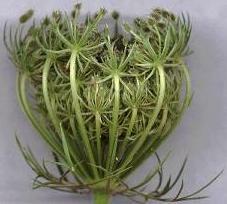 The birds-nest-shaped fruit cluster of carrot has a remarkable mechanism for seed dispersal. The stalks are hygroscopic, so that when conditions are dry and suitable for seed dispersal they bend outward, exposing the fruits to wind and animals; when conditions are wet, they bend inwards, forming the familiar bird’s nest structure, which protects the seeds. Colour is more intense in the older portions of the root. It decreases from the epidermis and center toward the cambium, and from the top to the bottom. Carrots can taste soapy or bitter - Two ingredients determine a carrot's flavour: sugars and terpenoids (volatile compounds that impart the carrot flavour). Some varieties are naturally high in terpenoids, which make the carrots taste bitter or soapy. Because terpenoids develop earlier than sugars, a carrot that is harvested too young might taste bitter. Many different terpenes in carrot can cause a turpentine-like taste. Usually terpenes give a desirable taste to carrots, but in high concentrations can give undesirable taste. Factors influencing undesirable taste include genetics, growing conditions, diseases and insects, post-harvest handling and storage atmosphere. Raw carrots will taste more soapy than cooked ones, as cooking breaks down the terpenoids allowing the sweetness to come through. The Nantes variety produces roots which have higher sugar content, lower in terpenoids and less suitable for long-term storage. A lot depends on the growing conditions ( if you grow your own) - the flavour is best if they mature when days are warm and sunny and nights are cool and still. The plant is photosynthesizing like crazy in the daytime and putting a lot of sugars down into the root, then a cool night comes and the carrot 'rests' instead of burning up that sugar. Where the night time temps stay in the 60s or warmer, the plants respire more at night and use up the accumulated sugars. So for the sweetest roots, time your carrot crop to mature at a time of year with warm days and chilly nights. and no matter what the conditions, harvest late in the day rather than in the early morning. Spring: Sow seeds in February for a forced crop under cloches of cold frame. March April Sow your next crop of Amsterdam Forcing seed outside protected by garden fleece in colder areas. These will be well on the way to maturity as your first crop finishes. recommended varieties Thumbelina, Suko and Baby Sweet. Summer: June/July Harvest forced types sow late main crops in lighter soil. Crop varieties like Chantenay Red Cored which were sown in March mature in August/September. Recommended varieties King Midas (Imperator type), Kurodo (chantenay), and Nelson nantes type). Autumn: August/September harvest early unprotected crops. October/November lift and store main crop types on heavier soil. Dig seed beds, remove any stones sow a crop of a forcing variety and protect under a cloche over winter. Recommended varieties: Juwarot and Fly away (nantes types) and Imperial Chantenay and Red Cored which are chantenay types. Winter: December/January on lighter soil later main crop types can be left in the ground and lifted as needed throughout the period. If the weather is really cold or wet, protect with a covering of straw in early December. Recommended varieties: Artist and Merida (nantes types) and Camberley and Scarlet Keeper (danvers types). Carrot twist around each other Plants too close together. Thin carrots to 2 inches apart when they are small. Carrots rotted or have large white "eyes". Overwatering. Water less frequently. Do not plant the carrots in heavy soil. White growth on leaves. Powdery mildew. Use fungicide if extensive damage. Sulphur may help. Thin spindly growth. Competition from weeds/other plants. Control the opposition. Rotted roots. White fungus on soil surface and on root. Small brown oval honey coloured sclerotia in fungal growth. Southern blight of white mould. Caused by Sclerotium rolfsii. Avoid planting in infested soil. Nitrogen rich fertiliser may help. Roots with surface tunnels filled with rusty mush. Stiff white maggots visible but nothing apparent above ground. Carrot root fly. Lays its eggs in the crown of carrots. Read more here. Peel off damaged area before using. Harvest carrots as soon as possible. Do not store carrots in ground through winter. Use a soil insecticide to control maggots at planting. Roots hairy, forked or mis-shaped. Root knot nematode. Overwatering, roots in contact with fertiliser pellets or fresh manure. Hard soil or rocks. Overcrowding. Rotate. Remove rocks. Thin carrots early. Carrots fail to emerge. Soil crusting. Soil temperature too high. Seedling pests. Maintain uniform soil temperature and moisture until seedlings appear. Do not plant too deeply. Yellowed, curled leaves. Stunted plants. Leafhoppers. Use insecticidal soap. Brown spots on leaves or roots. Leaf blight. Avoid planting in infested soil. Nitrogen fertiliser could help. Tiny holes on leaves. Flea beetles. Control weeds. Use rotenone with insecticidal soap. Inner leaves yellowed; outer leaves reddish purple, roots stunted and bitter. Aster yellows (mycoplasma disease). Remove affected plants. Control weeds. Use insecticide. Green root tops. Roots exposed to sunlight. Cover exposed roots with soil or mulch. 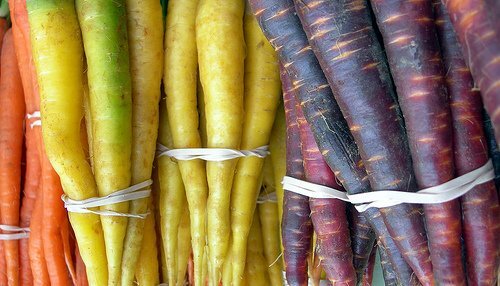 Carrots often have forked or branches roots or develop thin secondary roots - why? Damage to the growing tip of a young carrot. Common causes include soil insects and nematodes which feed on the growing tip resulting in branching of the carrot root. Carrots need a loose, friable soil to develop a good shape. Forking is caused by anything that impedes root growth. This includes nematodes, stones, or heavy, compacted soil. Causes include soil insects and nematodes which feed on the growing tip resulting in branching of the carrot root. Gardeners are often dismayed when they harvest hairy or misshapen carrots. 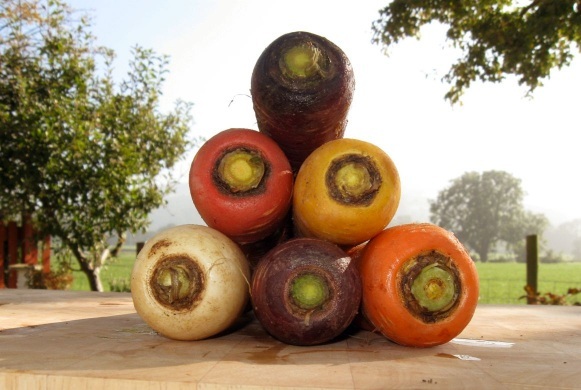 Imperfect carrots, or carrots with multiple roots – many of them twisted around each other – may come from several causes, including spacing, soil type, fertility, pests and disease. Your carrots could be overcrowded. Next time, try thinning them to an inch apart after the leaves reach about three inches high. Did you plant them in clay soil? If you have heavy clay soil, the clay sometimes forces the roots to grow crooked. Amend clay soil in next year’s carrot patch with well-broken down leaves, well-rotted compost. Carrots do well in light (sandy), fluffy soil that is not too full of amendments. Root-knot nematodes may cause deformed carrots. You can either verify this with a soil test and then you might have to solarize (treat soil with the sun’s heat using plastic sheeting in the summer), or rotate your carrots to another area next time. Did you fertilize right before you planted your carrots? Excess nitrogen (over fertilization) can cause carrots to form multiple roots or get “hairy.” If you add manure-laden compost to your soil, do so in the fall, then let it overwinter before planting carrots in the spring. Carrot roots will also become hairy in waterlogged ground. Did you leave your carrots in the ground too long? Carrots are biennials. The first growing season, they grow a taproot. Next they put out secondary roots off the taproot, and then put up the flowering stem the second year. 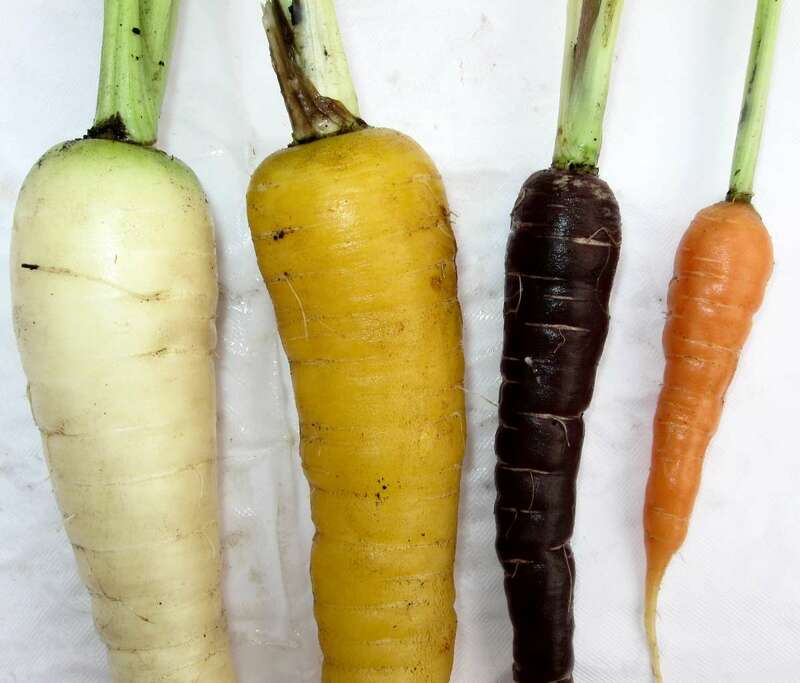 If you planted your carrots last fall, then over wintered them in the ground, they might be sending out whitish secondary roots by now and maybe a stem. Some varieties are more prone to bolting than others. 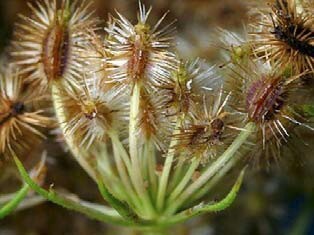 Cornel University, New York, has a useful list of fact sheets on common carrot diseases - click here. The University of California has some photos and further detail of common problems. - click here. A good reliable seed seller is Thompson & Morgan - normally F1's. See also the Seeds page here. The next page gives an in depth guide into carrot cultivation. This includes details on the best types of soil, cropping information. There is analysis of the number one pest - the carrot fly, categories of pests and diseases and the detailed classification of carrot types. Need advice? try Organic Vegetable Gardening (uk), one of the best vegetable advisory websites in the UK. Their aim is to help gardeners grow their own fresh, tasty vegetables and fruit using dedicated growing guides, and to give advice from fellow gardeners in a friendly forum.